Use Topsy as a data source – How can we help you today? Returns past 30 days worth of tweets for @Klipfolio. 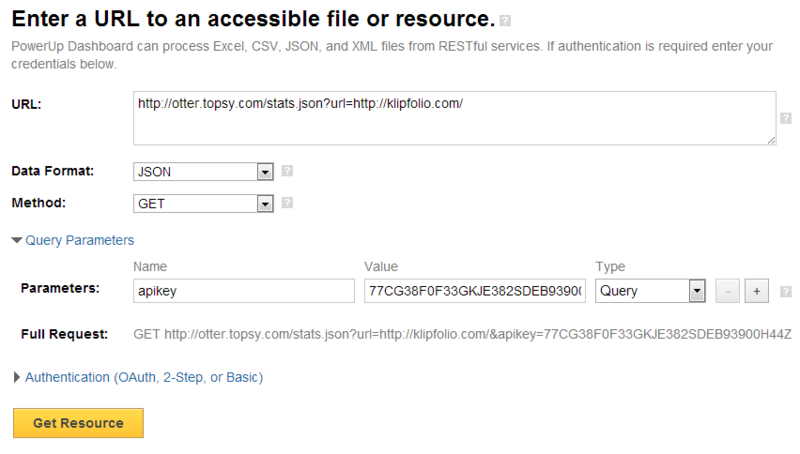 To create a data source using Topsy, go to the New Data Source page in Klipfolio and select the Web Accessible Resource option. Each type of API call will have required parameters associated with it. For instance, the search call requires you to fill out the q=search-term parameter. Klipfolio lets you add query parameters to the URL using the Query Parameters builder. This builder will automatically add the parameters to the URL using the correct syntax. At the minimum, you will need to add your API Key to the query. These procedures will detail how to do that; however, you can apply these steps to other, optional, parameters. Click the Query Parameter link. In the Name field, type apikey. To learn what query parameters you can add to your URL, please refer to the Topsy API Docs. You can use a variety of optional query parameters to further refine the data that you retrieve from Topsy. It's important to note that not every optional parameter will work with each type of call, so please refer to the Topsy API Docs. The following is a list of query parameters along with an example of a value you can use.